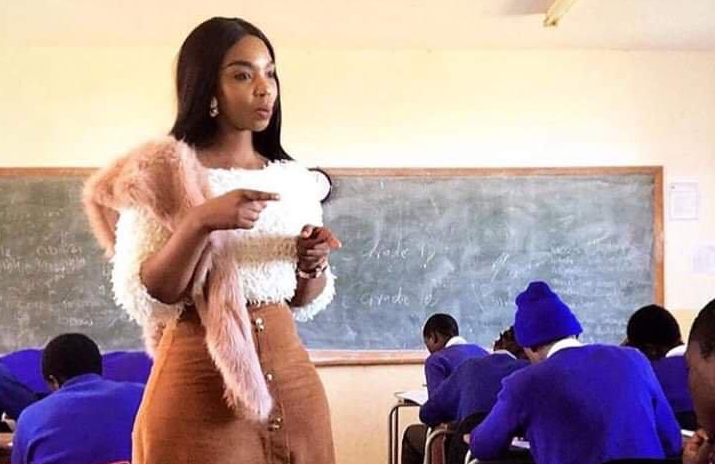 Buhle Menziwa, the school teacher who went viral for the way she dresses to work, has once again spoken out after she addressed her followers on Instagram Live through her private account. Buhle says her Instagram account is private because people have harassed and have stolen her pictures to post on fake accounts on Facebook. “I didn’t like the way I used to trend before so I thought to make it private,” she says. “You’d find people asking me ‘do you know this page?’ and I would tell them no, but a person [saved pictures from] my Instagram account and then shared them on Facebook accounts that I don’t know,” she adds. Buhle says the authentic social media account is her Instagram page. She tells us that she’s not on Twitter either, where the way she dresses was called into question. In the past week, Twitter users were abuzz where four pictures of Buhle were initially shared, driving the sentiment that the way she dresses is not appropriate for a school teacher. She said she found out about this post through friends who were sending her screenshots. In these pictures shared on Twitter Buhle is wearing full length pants with a buttoned up shirt with sleeves reaching her elbows in one outfit. In other outfits she is wearing dresses that go below her knees in length. “I felt like I was judged for who I am. When you’re reading some comments I feel like some people are jealous of me and then the men were just lusting - they wish they had a girlfriend like me or they wish they could have a partner like me,” says Buhle. Eventually, Buhle says she stopped wanting to see the screenshots and asked her friends to not share it with her. While there were mixed views from the Twitter comments, there were loud voices who deemed her way of dress inappropriate for a school teacher. But the Department of Basic Education does not have a dress code for teachers and entrusts the teachers to decide what is appropriate. He adds that, Buhle “should make a determination in terms of what is suitable as an attire at work where learners gather”. READ MORE: The app within an app that hopes to eliminate "sexual racism"
Buhle says [the criticisms] against her way of dress are not valid and says her colleagues and the learners’ parents have “never complained”. “I’m that teacher who comes to work dressed up and [the learners] always come and give me compliments. Some even tell me ‘Ma’am when I grow up I want to be like you’,” she says. Social media users have not only criticised her for the way she dresses, but started attacking her for the way she speaks as well. I always try by all means not to judge but "I am not teaching the kids on your age" made me dizzy. She says she appreciates the women who did stand up for her online. This young, stylish teacher adds that she has very supportive parents, friends and colleagues and that her learners are supportive as well. This woman's yoga posts are challenging body stereotypes – and she's winning!